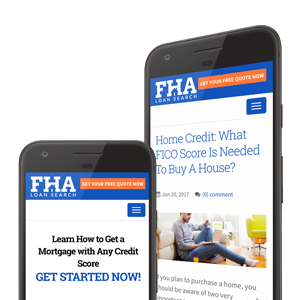 Home Credit: What FICO Score Is Needed To Buy A House? If you plan to purchase a home, you should be aware of two very important terms, credit and mortgages. For many reasons, these terms are interrelated when it comes to buying a home. Knowing what your credit score is can give you an idea of whether you will qualify for a home loan and also provide an idea of what sort of interest rate you might pay for it. Here is what you need to know about credit and how your FICO score may affect your mortgage. When lending money, a bank will also look at how strong your credit score is to better get to know you as a buyer. This is because a mortgage for banks is a huge deal. They are risking a lot of up front cash by giving you such a large loan. Therefore, the banks need to be sure that you will be able to pay back every penny, along with the set amount of interest. A person will increase their chances of getting a mortgage if they have a good credit score. So brings the question: what credit score do banks actually use? What Affects My FICO Score? Your credit score is calculated to show your lender how good you have been with your finances. Therefore, in the banks eyes’ this is your core reputation and FICO uses five general categories to measure your score over a range of 300 to 850. Home buyers should know that depending on their personal credit history, the importance of one factor such as Payment History may factor differently than “Amounts Owed.” As the items that show on your credit report change, the importance of the factors shown above may change. Because the FICO score is based on a mathematical algorithm, it is impossible to precisely measure or anticipate how a single factor may affect your FICO score without actually pulling your report. Your payment history will be a focus and is one of the greatest factors of importance in your FICO score. This information gives a bank information that indicates whether or not you have paid your past credit accounts in a timely manner. Do you typically pay your bills on time or are you always late? You have borrowed money in the past. Maybe you have an auto loan or perhaps you have some credit cards or other loans that are outstanding. These are very typical debts to carry and this won’t necessarily hurt your credit score or stop you from purchasing your dream house. A high-risk borrower would be someone with a great deal of amounts owed and also a poor or inconsistent payment history. If you happen to fall into this category, it may be helpful to get your free quote to see what you might pre-qualify for. This is a credit score influencer that may be significant. A long credit history may help increase your total FICO score. Fair Issac Corporation, the company that owns the FICO score system, will take into account how long your credit accounts have been established by determining the age of your oldest and newest accounts. In this process, an average account age is created. This factor also considers how active or inactive certain credit accounts are. Do you have mostly all credit cards or are many of your accounts retail accounts? Credit mix analyzes how many installment loans, mortgages, and other account types against each other to see where your money is going. A lender may want to see someone with greater use of installment accounts and credit utilization that does not exceed 30% of your overall credit limit. If you happen to have opened several accounts in a short period of time, this may present you as a riskier buyer. A bank may ask why you were looking to borrow a certain amount of money within a short period of time. All of these factors go into a calculated measure of risk and a person that shows a need for quick cash may appear as a risky client. This is especially true if the length of credit history is short. The basic FICO scores, being the FICO Score 8, uses a range of 300-850 to score you. As things apply to home credit, lenders will make sure that you do not borrow more than you can afford. A home buyer with a score above 800 is considered to be an exceptional buyer and this person ranks far beyond the national average. A good FICO score is somewhere between 670 and 739, representing an acceptable risk to most banks. Home loan seekers that have a FICO score that ranges between 580 and 669 are seen as “fair” noting that this is below the national average however it may be acceptable to many lenders. These borrowers will obviously not have as easy a time getting credit as someone with a score that is above 670 though they can still expect some options. FICO scores below 579 show as “poor” and about 61% of these consumers are likely to become delinquent in paying back their loans. The home loan process is not simple and you will have to make sure that your credit is up to date and accurate so that your FICO score is accurate. There are many different kinds of mortgages available in the market. You should be able to analyze the different types thoroughly so that you can know which option suits you the most. You should never go for an option or a house in which you will end up struggling to make ends meet. Always go for the option where you know that it will be easy for you to pay the set amount of money on a monthly basis, and that you will unlikely face any problems. People who plan in advance when it comes to home buying are smart and set themselves up for better interest rates in their mortgage. Knowing your credit scores and checking your credit report for accuracy are one of the first places you should start. Educated home loan buyers understand the mortgage system properly and also know what their credit history looks like. Get 20% off your 3 bureau credit reports at MyFICO now! Are you thinking of purchasing a home but you’re not sure where to start? If you are looking for someone who you can talk to about your situation and also provide you with a free home loan quote today, check your credit scores and Get Started here. FHA Loans with Bad Credit – Can I Qualify?